Stock # 0400, Revtech, 392 mi. Owner - Miracle Autosport LLC - This bike was built by one of our customers who is known in the area for his quality and attention to detail when it comes to his bikes. He usually builds one every two years, when the build is done he generally adds a few trophies to his wall and then starts a new project. It has been in my collection for nearly 10 years. He came in one afternoon because his wife wanted a new Corvette to play with since he generally is the one with all the toys. I had the itch for another chopper for quite some time so we made a deal. This bike is stunning and almost new. I have won 8 or the 10 shows entered and have gotten compliments from everyone that sees it. The paint itself cost more than my asking price and when I tell you no expense was spared, I mean every part was done right. This is a rare chopper that is actually rideable. The front end is balanced and doesnt fall to the left or right. Those of you who have been on a chopper know exactly what I mean here. More importantly, it never hasn't started. Every custom bike I ever owned seems prone to leaving me stranded a few times each summer. This bike has NEVER. This bike runs out great and looks even better. I have been putting off selling her but I just don't have the time to enjoy it anymore. If you are looking for a real piece of "rideable art" this is definitely the bike for you. The specs are below but the pictures speak for themselves. Please notice in the photos that the diagrams are included of the wiring. This is generally the hardest part of buying someone elses build, the lack of documentation. Everything you can't see with the naked eye is written down for easy maintenance and repair. 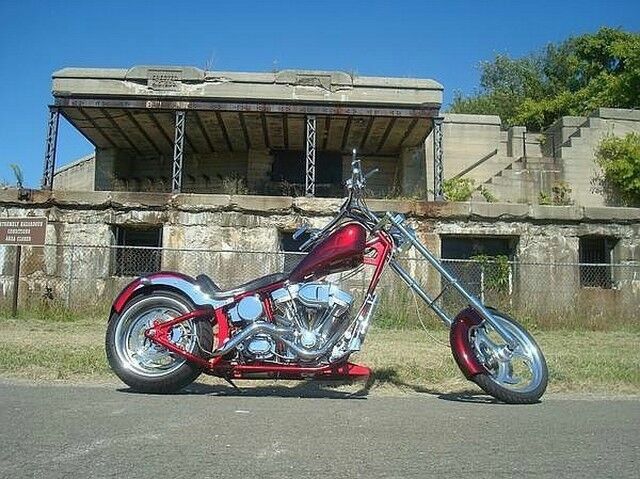 Frame: Ultima 250 Softail +8 Down Tube, 1 3/8" Tubing +6 Backbone, 1 1/2" backbone and post 38 Degree rake + 3 degree trees which equals 41 total degrees 12" Over Ultima Front End Adjustable Chrome Shocks, 2" Lowering Kit Fenders: Front - Pro One Rear - Xoprodox Chin Spoiler and tail light by Trotta Wheels: Chrome Horse "Bayonet" Matching Drive Pulleys and Rotors Avon Tires (250 Rear) Engine: 100 Cube Inch Revtech Diamond Cut and Show Polished 45 Mikuni Carbuerator Pro R Hypercharger Crane Single Fire Coil Martin Brothers Exhaust Dakota Digital Dash 3" BDL Open Primary Any questions on this bike just let me know!